Lightly spray each cavity with a little nonstick cooking spray and then wipe out with a paper towel. This will leave just enough residue to help release the shots once they have set. Separate the different colors into bowls and add one cup of hot water to each bowl. Stir until completely dissolved. Stir in 3/4 cup of chilled vodka. Pour jello mixture into molds. Refrigerate 4 hours or preferably overnight. Once completely set, partially submerge molds in warm water for about 10 seconds. Using a plastic knife, gently pull the edges away from the mold. Carefully flip shots onto a plate and refrigerate for another 30 minutes to firm them back up. Serve with matching mini fruit garnishes or on their own. 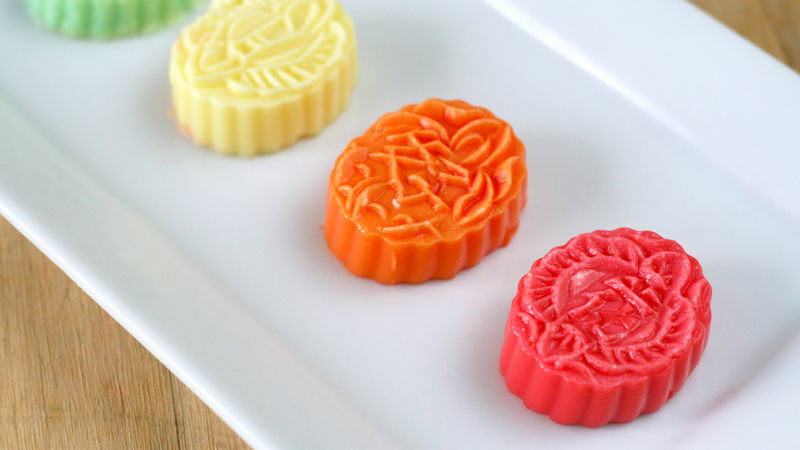 Say “I love you to the moon and back” with rainbow mooncake jelly shots. As the saying goes, you’ll love these Rainbow Mooncake Jelly Shots to the moon and back and they’re just in time to celebrate the Mid-Autumn Festival. For those of you unfamiliar, the Mid-Autumn festival is a harvest festival for lunar worship and moon watching in Chinese culture, and mooncakes are a delicacy offered between friends and family. Traditionally, these are baked goods, but a baker I am not. Jelly shots on the other hand… well that’s a whole new mooncake. I used small boxes of gelatin for this. Depending on how many molds you buy, you could have a lot of leftover jelly. To avoid this, you could just buy 3 boxes of primary colors (red, yellow, blue) and revert to your color wheel knowledge to achieve your desired shades. (Red + yellow = orange, yellow + blue + green). Separate your different colors into bowls and add one cup of hot water. Stir until completely dissolved. (I find sugar free works best for this). Stir in ¾ cup of chilled vodka. I think vanilla, whipped cream or cake vodka are great choices here to give more of a “cake” taste to the shots, but plain vodka would work too. Next, fill up your shots. To stabilize the molds, place them on a sheet pan. An easy way to fill them up is with a turkey baster. Otherwise, anything with a pour spout will work too. Refrigerate for at least four hours (but preferably overnight).